Online casinos began some 20 years ago. We expect the newer casinos to have learned well the art of the online casino. This Uptown Aces Casino Review will show that this casino certainly has. The first thing you’ll see is a wonderful home page with tons of easily accessible information. Check out our large choice of bonus codes for YOU! The online casino era began some twenty years ago. Much has changed since then. For example the new player bonus common to all online casinos has expanded in size and scope. They now often include a no deposit bonus code which gives players a chance to check out the casino without needing to deposit. As there is also a greatly expanded portfolio of games for online casinos, the no deposit bonus code is especially valuable to players. Many innovations in online casinos have come from the newer casinos that studied the trailblazers and learned what they did well and where online gaming could be improved for the benefit of players. Newer casinos have learned well the art of the online casino. This Uptown Aces Casino Review will show that this casino has perfected it in the few, short years since it was introduced in 2014. The first thing you’ll see is a wonderful home page with tons of easily accessible information. Many of the older, trailblazing casinos still have dark backgrounds with tiny letters and extra-long lines of text which, taken all together, make their home pages difficult to impossible to navigate. On the Uptown Aces home page you’ll find links to many inside pages all of which have easy to read text. The Uptown Aces new player bonus enjoys the most prominent place on the casino’s home page. Actually, readers of Slots Play Casino have access to three different new player bonus offers. They differ in the details. One has a no deposit bonus element. The biggest, for $8888 covers six deposits while the exclusive bonus for new players through SPC is a 400% bonus for up to $4000. That means that with a $1000 deposit, you’ll get a total of $5000 to play with! At other casinos, the play through requirement is too often hidden in the small print. This is decidedly not the case at Uptown Aces! They tell you exactly what your play through requirement will be for every bonus offer you accept. The play through aspect of deposit bonuses is fair but too many casinos set the requirement too high. The requirement means that you have to bet a function of the deposit and bonus before you can withdraw winnings from that bonus. Without the play through feature, players would withdraw their bonuses without making any bets at all! At Uptown Aces, the play through requirement varies from a mere 10-15% for some bonuses, 25% for others, and 30-35% for the most lucrative bonuses. These percentages are a far cry from the 45-50% requirements at many online casinos! 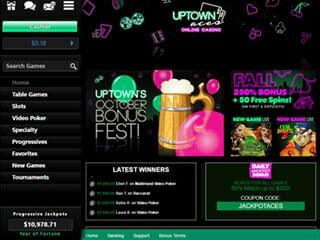 Uptown Aces seeks to maximize the fun side of online gaming. The low play through rates are just one of many examples of the casino’s business philosophy. The welcome bonus offer is only the first promotion you’ll enjoy as a gamer at Uptown Aces. Click on the link at the top of the home page and you’ll get all the information you need about ongoing and temporary promotions. Uptown Aces never stops developing promotions that satisfy players so the information on the promotions page changes at least monthly. Click on the link often to stay up to date on all the casino’s promotions. To the left of the promotions page is a link to weekly promotions. This is always a long list of promotions on various games. The games involved and the size of the promotions vary from week to week so come to this page every week. The link also contains information on daily bonus code offers in blackjack, progressive games, and video poker. If you prefer playing without a bonus and thus without a play through requirement, you can opt for the Cash Back promotion. At Uptown Aces they combine these two promotions. You can join the VIP Club with only a $1000 deposit. After that, you can receive 30% instant cashback on weekdays and 10% on weekends, the daily bonus of 100% up to $500, and easy monthly activity requirements. There are three other levels in the VIP Club. The minimum deposits are higher and all the basic benefits are enhanced. At level four, you get one comp point for every $4 bet! At the top of the home page is a link to the tournaments page. The list is quite long; every gamer can find more than one tournament to compete in! there are tournaments every day so if work or family obligations prevent you from playing in a tournament one day, you only have to wait until the next day to get in on another great tournament! Look at the buy in costs; they are mostly free and the highest buy in is for five cents! The pots are also relatively small. This is one of the most popular aspects of gaming at Uptown Aces—you can win a nice but modest sum of money just having fun playing slots or other tournament games. This is another important element in Uptown Aces’ gaming philosophy: gaming is, above all else, fun. Newer casinos such as Uptown Aces were the first to see the importance of having the best graphics for their instant play platform. In the past, casinos either required the player to download the entire casino to their hard drive or, if they offered a version of instant play, the number of games was severely limited and the graphics were far inferior to the download platform’s graphics. Uptown Aces always does everything it can to make gaming easy and fun. The primary problem with downloading a casino is that casinos are “heavier” today than they were twenty or even ten years ago. With so many other forms of entertainment to download to our hard drives, a casino may over-burden the computers. Instant play puts no burden on your computer at all and at Uptown Aces, the list of games available on the instant play platform is long and the graphics are state-of-the-art. The secondary problem with downloading a casino is that there are thousands of casinos and about 150 game providers. No casino can carry all these games. So players choose to play at several casinos in instant play. Uptown Aces is well aware of this phenomenon and actually encourages it. Remember, at Uptown Aces gaming is first and foremost fun and if gamers want to play games from a number of providers, they are welcome to do so. So, while Uptown Aces also offers a download platform, they are well aware that many players prefer to play in an instant play platform. 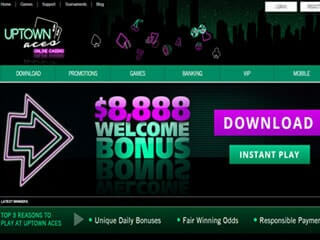 Thus, instant play at Uptown Aces is as good in all aspects as the download version. 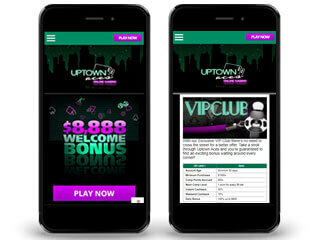 The third gaming platform at Uptown Aces is mobile. Even a few years ago, online casinos were struggling to bring their mobile platform up to the standard of their desktop casino. The mobile casino at Uptown Aces has always featured the best graphics. For the obvious convenience of mobile and for the superior graphics on the Uptown Aces mobile platform, mobile is fast eclipsing desktop gaming in popularity. The Uptown Aces gaming philosophy is on full display in its excellent selection of games. The casino features about 200 games in several categories. The games are provided by Real Time Gaming and Uptown Aces has chosen only the very best to offer gamers. Too many online casinos are overloaded with obsolete games that those casinos are reluctant to remove. Those casinos like to brag about having 600 or more games. The Uptown Aces approach is different. Remember, gaming is at its most basic level a fun and entertaining pastime so the casino offers only the most fun and entertaining games with the best features. Real Time Gaming is a prolific game developer so the number of games offered by Uptown Aces grows every month. Uptown Aces features some of the best-known and loved RTG slots such as Achilles, Hairway to Heaven, Sweet Sixteen, and Aztec’s Treasure. Slots are usually the most popular casino game at both online and land based casinos. The slots at Uptown Aces combine great entertainment value with terrific graphics and high payout percentages to create a super gaming experience for slots lovers. Because slots are so popular, they represent one of the big advantages of gaming at an online casino such as Uptown Aces as opposed to gaming at a land based casino. At an online casino, you never have to wait for the slot of your choice to “become available”. Even if hundreds of gamers from all over the world are playing the game you want to play, you never have to wait. In contrast, how many versions of even the most popular slot can a land based casino have? The slots at Uptown Aces have many great features including the ubiquitous wild and scatter symbols plus stacked reels, cascading reels, expanding wilds, nudges, multipliers, and more. The symbols in all of the casino’s slots are interesting in themselves; the graphics are realistic; and the sound quality is second to none. Uptown Aces also has a big and growing selection of table games. You’ll find the classic games here: a selection of blackjack and poker, plus baccarat and Three-card Rummy. Interestingly, the casino lists roulette, Sic Bo, and craps in their list of specialty games. It seems that gamers universally consider the excitement that obtains around the roulette wheel and craps table at land based casinos exceeds the excellent graphics in these games at online casinos. At online casinos, roulette and craps have long been less popular as table games than the others mentioned above. Uptown Aces placed roulette and craps inn the Specialty Games category because Real Time Gaming has made a Herculean effort to get the graphics in these games as clear and entertaining as possible. Because the graphics, which are especially difficult for developers to get right, have been so improved in these games, Uptown Aces decided to list them in a separate category as a way of drawing attention to them. So far, that strategy has paid off as the players at this casino play roulette and craps more than at most other online casinos. The casino offers multi-player roulette and all three roulette variations: American, European, and French. We always recommend to our readers to play French roulette only. Like the similar European roulette, French roulette has only the single 0 slot. By eliminating the 00 slot, the house advantage is cut in half. The unique rules that apply to even-money bets in French roulette are so friendly to players that they reduce the house advantage by almost another half. Even if you never make even money bets in roulette, we encourage you to play only with the European version with the single 0. Your chances will be so much better. Other specialty games include keno, bingo, and scratch cards. You should always distinguish between poker table games and video poker. Both categories give you the finest poker excitement; the play of the games and the strategies you need to win differ. We always encourage players to use the free play mode, especially in decision-making games such as blackjack and poker, so you can know a game well before you place a bet on that game. Poker and blackjack are the primary “intellectual” games offered at online casinos. In these games, strategy plays a big role in winning so we encourage everyone to use a strategy card when playing these games for real money. The payout rate for video poker usually runs close to or above 99% so correct play can make you the favorite over the house! The casino offers many progressive jackpot games. At this writing, there are seven in slots and four in poker. One bit of advice to progressive players: in order to win the big jackpot, you have to bet the maximum on all lines. If you choose to bet less than the maximum, you probably should play a different game rather than the progressive one. That’s because the casino or the game provider take a few cents from each bet in order to grow the jackpot. That means that the payout rate for regular spins or hands is less than in the many other slots and poker games available. Uptown Aces offers several deposit and withdrawal options. The newest and most unusual for most gamers is Bitcoin. Although Bitcoin is still called a cryptocurrency by those big money interests that would like to sit it disappear, Uptown Aces was one of the first casinos to see the growing popularity of an alternative currency. Above and beyond all the gaming software provided by Real Time Gaming (RTG), the most important software used by Uptown Aces and all other reputable online casinos is the encryption software that protects your money, all your financial transactions with the casino, and all of the personal information you supply the casino upon registering and withdrawing funds. One word about security when withdrawing: Many gamers object to having to provide proof that they are who they say they are when they want to withdraw money. Uptown Aces is certainly not the only online casino that is extra cautious with players’ money when they request a withdrawal; all reputable casinos do so. As secure as the casino is, there are many hackers out there looking to game the system. The casino adds a single layer of caution to protect you. Another aspect of security is making sure that gamers feel confident that the games are all honest and aboveboard. To that end, the casino uses a Random Number Generator (RNG) to determine the outcome of every game. In this way, the casino can confidently assure gamers that there is no such thing as a hot or cold game. When players evaluate a casino, they site games, bonuses, promotions, security, safe banking, and graphics. All of these are essential aspects of a great online casino experience. To these we add customer service. Players often have questions, need clarifications, and sometimes have a disagreement with the casino. It is up to the customer service team to be available at all times and to be able to answer all questions and handle all circumstances clearly and quickly. Players can reach the customer service desk on a 24/7 basis via skype, email, chat, or telephone. The customer service representatives are well-trained to handle any questions you might have and to resolve fairly any differences. The casino is well aware that it is in the area of customer service that most complaints against other online casinos are made at online forums. So Uptown Aces does everything it can to answer your questions, resolve misunderstandings, and also, importantly, to monitor their customer service team from within. This Uptown Aces Casino Review is meant to interest you in checking out the casino. You can play in free play mode without making a deposit in order to get to know the casino. We also suggest you contact customer service and ask them about the casino. We think you’ll find that the team is friendly and helpful. And we believe this ia a good indication that the overall gaming experience within is also friendly, helpful, and fun.